Did you know that a floor lamp can be decorative as well as functional? This handy guide is sure to help you find the right one to complete the look of your room. In my world, the perfect floor lamp of yesteryear was one that had a metal pole, a flared faux silk lampshade and lots of scrolly thingys. 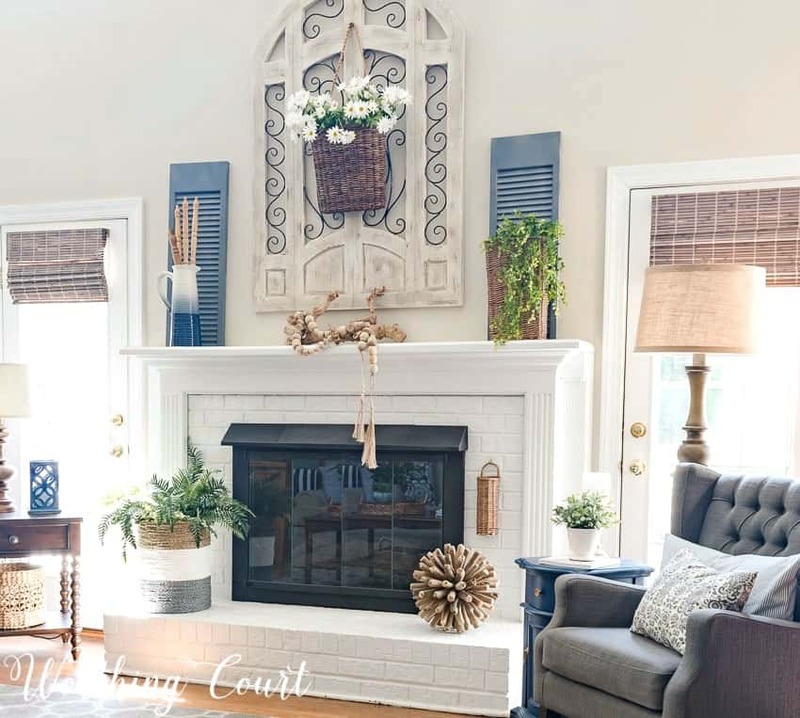 As my decorating style has changed and evolved, that look just didn’t work for me anymore. I’ve tried painting my old metal lamps and changing the shade to give them the look that I was after. While that certainly helped, it didn’t change the fact that the spindly nature of the stand was just too dinky for the spots where I wanted or needed the functionality of a tall lamp. The floor lamps of today do more than just provide light – I believe they can actually be a feature in a room and can even go so far as to feel like a piece of furniture. I used to have one of those metal versions with the skinny pole in my family room and while it didn’t have any scrolly parts, it was still too small for the space. Pretty? Yes. Functional? Yes. Perfect for the spot? Not quite. I’ve zoomed in on this little corner in my family room, so this lamp may seem perfectly fine here. But when you looked at the room as a whole it was a bit to skinny. Take a look at what this spot looks like now and check out what a difference the updated, chunky lamp makes! Nothing has changed in the spot, with the exception of the seasonal decor, but the whole area looks so much better to me. Without going to a lot of expense, the whole space just looks more polished and finished. Here’s another zoomed in shot from this year’s fall home tour. So, have I a made a believer out of you? 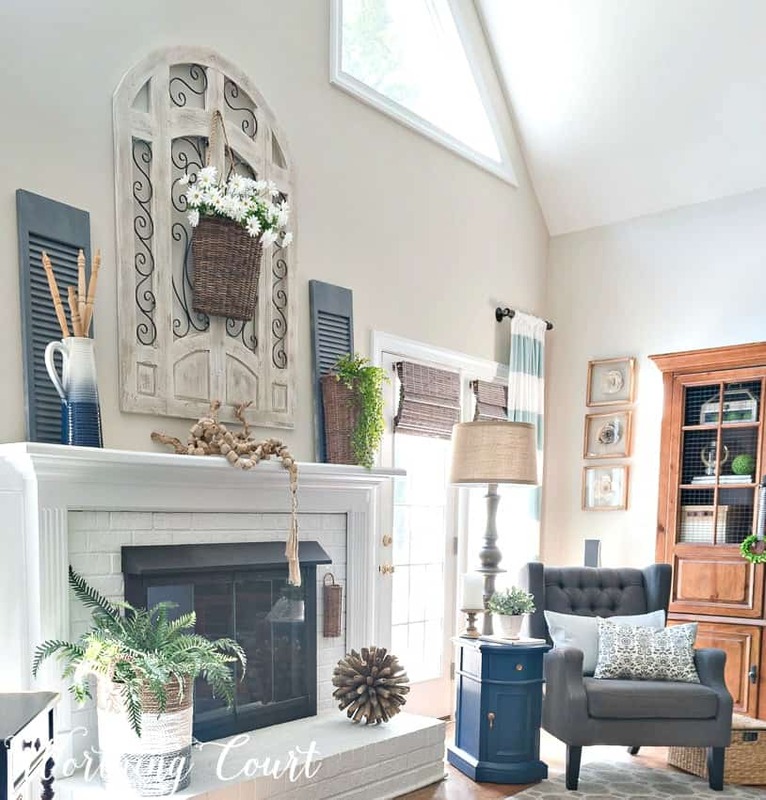 If you think that a floor lamp might just be the one element you need to complete the look of your room, take a look at this handy roundup of amazing lamps that I found. You’ll find a link leading directly to each lamp below the image. They’re all budget friendly, so you’re sure to find something that will work for you! I agree with you. Ceiling lights and table lamps need to be the correct scale also. My husband and I have matching floor lamps. Don’t know what we’d do without them for reading. Still enjoyed looking at the current trends and what is available. I hadn’t given much thought to my skinny floor lamp lately, but I do like the look of the chunky lamps that you featured. A new Kirklands opened in our area recently and I will definitely be keeping them in mind when I shop for a new lamp. Great selection and reasonably priced. Thank you for sharing! Love the floor lamps. I have 2 in my living room and they make a big difference. Love the lamp and the side table. Very cozy corner. 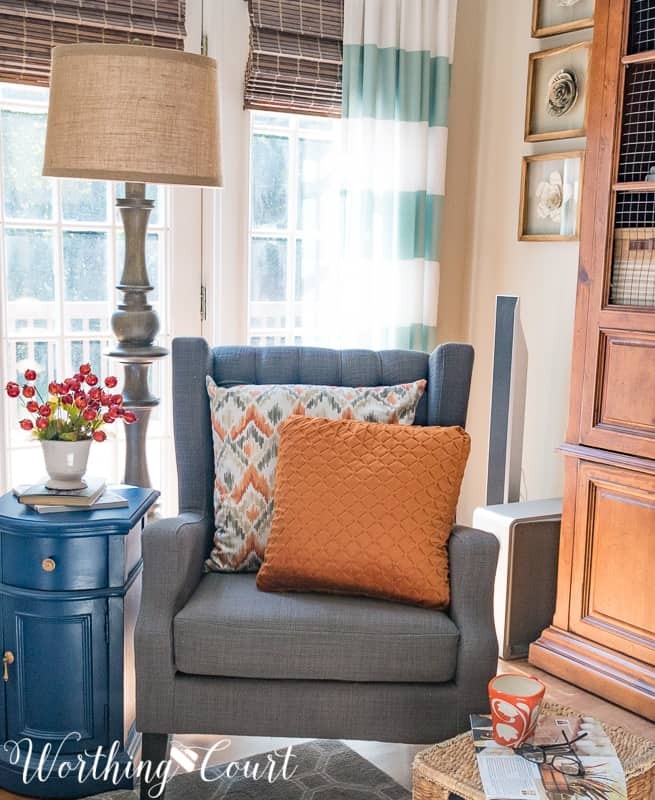 I think the floor lamp you picked out is just perfect for your space! I love my floor lamp. It sets next to my chair where I do my cross stitching & read to my grandson. They are one lamp you can place where ever extra lighting is needed. I bought a gorgeous floor lamp, placed it in every conceivable spot, finally returned it! They’re great but somehow, I just can’t find a free floor space for one. I have multiple beautiful table lamps so I’ll just have to admire from afar until something changes! I love a floor lamp and have one in my den and one in my bedroom. Your choice is great! These floor lamp options are great, thank you! For some reason it’s not letting me pin it-just wanted to let you know. It could be on my end though! Love the lamp! 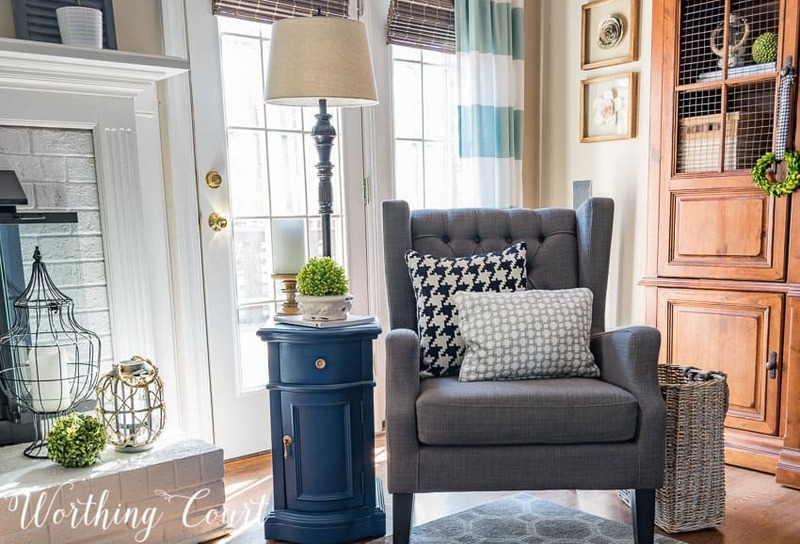 Could you give me the source for your little blue table next to the chair – just so perfect for the space! Thanks! Now I want to replace my brass floor lamp with one of the more architectural styles from Kirkland! I’m not sure which of styles 6-12 I’d pick since I like them all. Nice one. Love the floor lamp. Thanks for sharing this post. These are beautiful… Not sure if I can get away with one in My Wee Abode. Decisions, decisions! Now I need to scope out a floor lamp spot. I always love when you give us so many choices that are a reasonable cost and look so good. Thanks again. This inspired me to get a different floor lamp. I love the difference it made in my room! I love my my task floor lamp, it is great for reading and hand stiching. Now I need to get a floor lamp for my 87 year old aunt, the light from the end table lamp doesn’t produce enough direct lighting. Great post. That cozy reading corner looks so inviting! Love the floor lamp. I’ve been online looking for floor lamps. These are good ideas. For me, it has been harder to find floor lamps than table lamps that seem right.